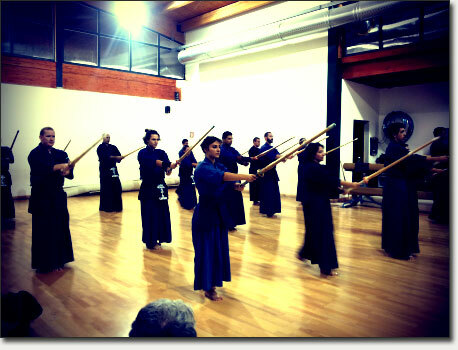 The beginning of Kendo practice at ARK (Accademia Romana Kendo) is easy and it's a choice that, if carried on, might well lead to a remarkable passion. The first three trainings are free of charge and do not require any commitment. To begin it is enough a suit, a pair of slippers (Kendō is practiced bare feet) and the necessary to shower after training. Shinai, the bamboo sword used during practice and matches, is used since the first training and is supplied to beginners by the ARK. At the beginning a great emphasis is laid upon the study of fundamentals: leg movements , cut techniques (the hits delivered with the sword/shinai), understanding of the right distance, pressure on the opponent, and so on. Once understood weather there is any interest for Kendō, somewhere about the first month of training, it is the time to adopt the typical dressing. Usually at this point it is more advisable to own a personal shinai. The cost for the various equipment may vary depending on their characteristics. However, at the begin, classical economic model are no more expensive than few tens of Euros. After few months of practice, after having acquired a general knowledge of the basic techniques and, anyway, when the instructor deems it fit, the beginner might start practice with bogu (the armour). ARK has a certain number of bogu available, until one is able to acquire ones own [see page equipment for more information]. In the picture: foundamentals excercises during training..